Indiana Sailing Association coach Geoffrey Barrow, on right, familiarizes Block Middle School eighth-grader Guillermo Domiguez with a sailboat July 27 during the orientation session of the Upwind learning program at the East Chicago Marina. Photo by Kyle Telechan, The Times. 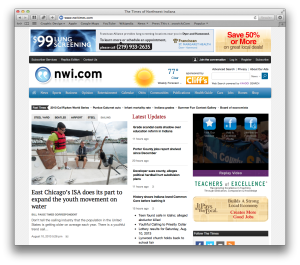 The article featuring Indiana Sailing Association appeared on The Times homepage August 11, 2013. View the article now. The Indiana Sailing Association is launching a new program this year as part of the “Communities in Schools Integrated Student Services” grant. The Indiana Sailing Association is providing a Science, Technology, Engineering, and Mathematics (STEM) curriculum along with introductory sailing experiences in an afterschool program format as part of the grant. The grant is being led by Communities in Schools of East Chicago in collaboration with the Indiana Sailing Association, Calumet College of St. Joseph, and HealthVisions Midwest. A portion of the program funding is made possible by the Foundations of East Chicago. The Indiana Sailing Association appreciates the collaborative support of the City of East Chicago, East Chicago Marina, Port Authority of East Chicago, and the many other supporters who have helped to make youth sail training possible for more than 25 years. Can you name this mystery knot – number one? Click here to read all the recent news from the Indiana Sailing Association. From time to time the Indiana Sailing Association reorganizes the fleet to match current and future programming needs. Check back here for more information about surplus boats in our inventory. © Indiana Sailing Association, Inc.